Whitewater rafting is one of the fastest growing adventure sports and provides a perfect activity for families, scouting or church groups or just about anyone looking for a new challenge. Michigan is home to some of the best whitewater rivers in the Midwest. Located about five hours from Chicago or Minneapolis, the Menominee River on the Michigan/Wisconsin border offers challenge and thrill for the avid whitewater enthusiast as well as first time paddlers. 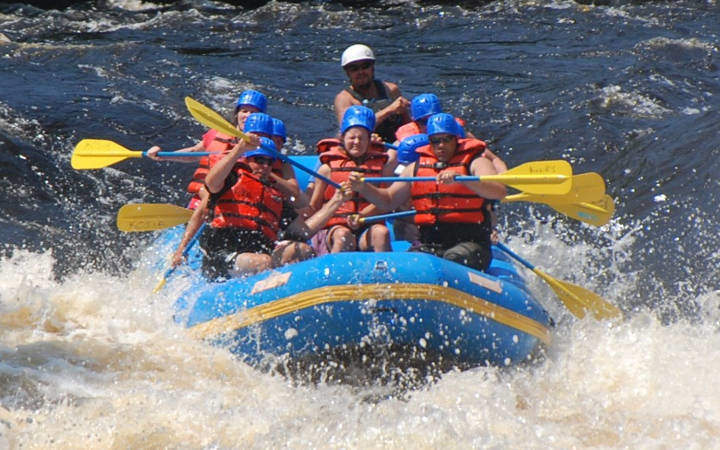 The Menominee River is a great rafting trip for those that want big water like you might find on some of the well known western or eastern rivers. The Menominee is dam-controlled and has flows that range from around 1,500-15,000 cfs. In the driest times, it usually still has a flow of at least 900cfs. Most people have no idea that we have whitewater rafting like this in Michigan. I would like to encourage you to learn more about paddling whitewater and I hope you will join us soon at Kosir’s Rapid Rafts for a trip down the Menominee River on the Wisconsin-Michigan border.